There is an award-winning hotel in Patagonia I dreamed about for a while. Ecocamp. The first time I heard about it was, of course, on Instagram. I was scrolling through photos of South America and there it was. This epic hotel in the middle of Torres del Paine with an eco-friendly architecture so stunning that it leaves all of us, adventure and nature lovers, speechless. Fast forward time, and I got to visit it for myself so I could share it with you guys! This trip started with a lot of excitement and a flight from Miami to Santiago, where I spent an entire day visiting friends I hadn’t seen in a while, and then another flight from Santiago to Punta Arenas. Once in Punta Arenas, we were picked up by Ecocamp’s driver and taken to a beautiful hotel in downtown Punta Arenas so we could have breakfast and relax before we embarked on the majestic 5-hour drive to Ecocamp with a quick lunch break in Puerto Natales (location of Ecocamp’s office). During the drive, the scenery was something taken out of a National Geographic magazine. Mountains covered in snow, blue lakes, llamas, and miles of the greenest grass. This all intensified the minute we reached Torres del Paine- a protected national park encompassing mountains covered in snow, glaciers, lakes, and rivers in southern Chilean Patagonia. And, in the middle of all of this hides another precious gem: Ecocamp. Ecocamp, in case you haven’t heard of it, is an eco-friendly hotel known for the 33 insulated domes it offers as rooms to its guests. Yes, domes! 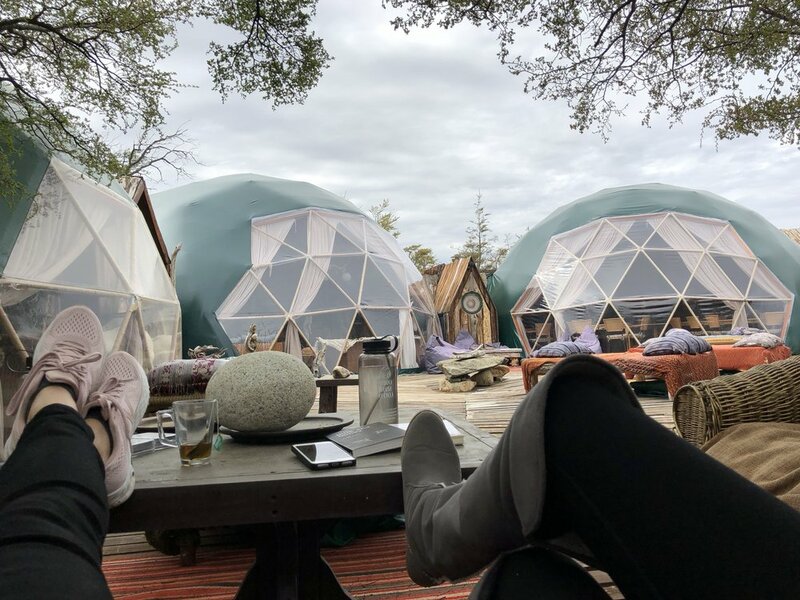 The domes vary in size and luxury from the standard ones to the suites, and I got the chance to stay at both to share every little detail with you! After the 5-hr car ride to the hotel, we- my cousin and I- got to Ecocamp around 6pm exhausted but incredibly amazed! The second we stepped a foot outside the van and on Ecocamp’s premises, our jaws dropped and our minds began to wander. There were domes everywhere that looked liked big igloos made of sustainable materials. Even the reception, community lounge, and yoga room were gorgeous domes! We were both so excited that we ran to our standard dome, left our bags, and immediately went on a walk around the premises to discover what other magical corners it had to offer. Temperatures in Patagonia in October are usually low at night -3C/26F and around 3C/37F during the day. Coming from Miami, I was obviously not prepared for such low temperatures at night but, fortunately, Ecocamp has a boutique that carries Patagonia jackets, hiking gear, and hand-knitted sweaters by local artisans. Their store also supports a wildlife sanctuary! I got myself a Patagonia jacket (Patagonia is a sustainable brand I adore; hence, my jacket was made of recycled materials) and a few handmade things I fell in love with. That same night, we met with our tour guide who explained the activities for the next 2 days, drank a delicious welcome cocktail at the community lounge, and enjoyed a vegan dinner paired with wine that tasted like heaven! After dinner, we found our way to the fire place in the community lounge, sat next to it for a little while, talked about life (I hadn’t seen my cousin in a year) and then called it a night just in time to step outside and be surprised by a sky entirely covered with stars. It looked so spectacular and close to us, we completely forgot about the -3C temperatures! After connecting with the moon and the universe for a bit, we walked to our dome, put on as many layers as possible, and called it a night. The next morning we woke up at 7, changed (no showering the first morning. I could barely feel my hands!) and went straight to breakfast to make it in time for our first activity: the glaciers! Breakfast was buffet style and they also had a section to make yourself a sandwich for the road. Lots of vegan and vegetarian options here too! My cousin and I were lucky enough to get sunny days with clear skies during our entire stay which let us contemplate the peaks of Torres del Paine completely. After the boat tour, we headed back to the hotel for dinner and stayed at our new dome. The suite! One of those places that makes you feel at home...inside a sustainable dome...powered by the sun… in -2C/28F weather… with a heated room and more than enough space for you to flow through your yoga practice... with a king size bed, a fire place, a bathroom with a compostable toilet, a shower with hot water, and a heater preparing the bathroom for when you get out of the shower…all surrounded by mountains covered in snow. Paradise does not even begin to describe this experience! The next morning, we decided to stay at the hotel and explore the premises instead of doing a hike. That was our last day and the idea of getting on another car and then taking two flights back to Miami had me feeling physically exhausted already. (I recommend staying longer than 4 days since two of those days will be spent traveling to the hotel and might leave you drained). So that’s exactly what we did. We pampered our minds and bodies. It all started by contemplating a pink sunrise at 6am, followed by my yoga practice, a delightful vegan breakfast during which we didn’t rush. After breakfast we went outside and sat on their outdoor bohemian area that looked like a scene taken out of a Disney movie. Carpets, old doors, colorful sofas and pillows everywhere, and three big domes. We played cards, drank coffee, talked, laughed, read books and then walked to the massage dome to get our treatments. After our massages, we walked back to our suite dome while a magical sunset took over the ambience fully, made ourselves a warm cup of tea in our suite (each suite has its own tea/coffee corner)and put some charcoal face masks before heading to dinner. That same night, after dinner, Ecocamp had a guitar player at the community lounge. Wine, music, and the fireplace. Heavenly! The perfect way and day to practice self-love rituals! The next morning we had breakfast early and found ourselves on our way to Punta Arenas to catch our flight back to Santiago. -Their packages depend on season, length (all the way from 3 nights to 6 nights), and dome type (standard or suite). They include meals, snacks, stay, car transport and activities. -There is NO WI-FI at Ecocamp. Time to disconnect and reconnect with nature! They do offer a laptop for emergency use and emails. Hay un hotel famoso en la Patagonia con el cual soñé por mucho tiempo. Ecocamp. La primera vez que oí de el fue, por supuesto, en Instagram. Estaba mirando fotos de Sudamérica y ahí estaba. Este hotel épico en medio de Torres del Paine con una arquitectura ecológica tan impresionante que nos deja a todos los amantes de la naturaleza y la aventura, sin palabras. Y este Octubre, finalmente pude visitarlo para compartirlo con ustedes! Este viaje comenzó con mucha emoción y un vuelo de Miami a Santiago, donde pasé un día entero visitando a una amiga que no había visto hace mucho, y luego otro vuelo de Santiago a Punta Arenas. Una vez en Punta Arenas, fuimos recogidos por el conductor de Ecocamp que nos llevo a un hermoso hotel en el centro de Punta Arenas para poder desayunar y relajarnos antes de embarcarnos en el majestuoso viaje de 5 horas a Ecocamp (con un breve almuerzo en Puerto Natales- la ubicación de la oficina de ecocamp). Durante el viaje, el paisaje era algo sacado de una revista de National Geographic. Montañas cubiertas de nieve, lagos azules, llamas y miles de millas del pasto más verde. Todo esto se intensificó en el momento en que llegamos a Torres del Paine, un parque nacional protegido que ofrece montañas cubiertas de nieve, glaciares, lagos y ríos en el sur de la Patagonia Chilena. Y, en medio de todo esto, se esconde otra joya preciosa: Ecocamp. Ecocamp, en caso de que no hayan oído, es un hotel ecológico conocido por las 33 domos aislados que ofrece a sus huéspedes como habitaciones. Sí, domos! Los domos varían en tamaño y lujo desde las estándar hasta las suites, y… tuve la oportunidad de quedarme en ambas para compartir cada pequeño detalle con ustedes! Después de las 5 horas de viaje en carro hasta el hotel, mi prima y yo llegamos a Ecocamp alrededor de las 6 pm, completamente sorprendidas! En el momento en que pusimos un pie fuera de la camioneta y en el terreno de Ecocamp, se nos cayeron las mandíbulas y nuestras mentes empezaron a divagar a un mundo mágico. Habían domos en todas partes que parecían grandes iglúes hechos de materiales sostenibles. Incluso la recepción, el salón comunitario y la sala de yoga eran hermosos domos. Los dos estábamos tan emocionados que corrimos a nuestro domo estándar, dejamos nuestras maletas e inmediatamente dimos una vuelta por las instalaciones para descubrir qué otros rincones mágicos tenía Ecocamp para ofrecer. Las temperaturas en la Patagonia en octubre son generalmente bajas por la noche -3C / 26F y alrededor de 3C / 37F durante el día. Viniendo de Miami, obviamente no estaba preparada para temperaturas tan bajas por la noche, pero, afortunadamente, Ecocamp tiene una boutique que ofrece chaquetas de la marca Patagonia, ropa de excursión y suéteres tejidos a mano por artesanos locales. Su tienda también apoya un santuario de animales silvestres! Me compré una chaqueta Patagonia (Patagonia es una marca sostenible que adoro; por lo cual mi chaqueta estaba hecha de materiales reciclados) y algunas cosas hechas a mano de las cuales me enamoré. Esa misma noche, nos reunimos con nuestro guía turístico que nos explicó las actividades de los próximos 2 días, tomamos un delicioso cóctel de bienvenida en el salón comunal y disfrutamos de una cena vegana acompañada de un vino que sabían a cielo. Después de la cena, nos dirigimos a la chimenea en el salón comunal, nos sentamos a su lado por un rato, hablamos sobre la vida (no había visto a mi prima en un año) y luego terminamos la noche justo a tiempo para salir a un cielo completamente cubierto de estrellas. Se veía tan espectacular y cerca de nosotros, que nos olvidamos completamente del frío de -3C! Después de conectarnos con la luna y el universo por un rato, caminamos hasta nuestra domo, nos pusimos tantas capas de ropa como nos fue posible y nos desmayamos en cama. A la mañana siguiente nos levantamos a las 7, nos cambiamos rapidito (no había manera que me duche en ese frío! ¡Apenas podía sentir mis manos!) y nos fuimos directamente a desayunar para llegar a tiempo para nuestra primera actividad: los glaciares! El desayuno era tipo buffet y también tenían una sección para hacerte un sándwich para el camino, con muchas opciones veganas y vegetarianas! Mi prima y yo tuvimos la suerte de tener días soleados con cielos despejados durante toda nuestra estadía, lo que nos permitió contemplar perfectamente los picos de Torres del Paine. Después de la excursión en barco, nos dirigimos de regreso al hotel para cenar y nos quedamos en nuestro nuevo domo. ¡La suite! Uno de esos lugares que te hace sentir como en casa ... dentro de una cúpula sostenible ... con energía solar ... en un clima de -2C/28F ... con una habitación con calefacción y un espacio más que suficientemente grande para fluir durante mi práctica de yoga. .. con una cama king size, una chimenea, un baño con inodoro compostable, una ducha con agua caliente y una estufa que prepara el baño para cuando uno salga de la ducha ... todo rodeado de montañas cubiertas de nieve. “Paraíso” ni siquiera comienza a describir esta experiencia! A la mañana siguiente, decidimos quedarnos en el hotel y explorar las instalaciones en lugar de hacer una caminata. Ese era nuestro último día y la idea de subir a otro carro y luego tomar dos vuelos de regreso a Miami me agoto físicamente y mentalmente. (Recomiendo quedarse más de 4 días ya que dos de esos días se gastarán viajando al hotel, y los dejará agotados). Así que eso es exactamente lo que hicimos. Cuidamos nuestras mentes y cuerpos. Todo comenzó contemplando un amanecer rosado a las 6 am, seguido de mi práctica de yoga, un delicioso desayuno vegano durante el cual no nos apresuramos. Después del desayuno, salimos y nos sentamos en el área bohemia al aire libre que parecía sacada de una película de Disney. Alfombras coloridas, puertas viejas, sofás y almohadas bohemias por todas partes, y tres grandes domos. Jugamos cartas, tomamos café, conversamos, reímos, leímos libros y luego caminamos hasta el domo de masajes para recibir nuestros tratamientos. Después de nuestros masajes, caminamos de regreso a nuestra suite mientras una puesta de sol mágica se apoderaba completamente del ambiente, nos preparamos una taza de té en nuestra suite (cada suite tiene su propio rincón de té / café) y nos pusimos máscaras faciales de carbón antes de irnos a cenar. Esa misma noche, después de la cena, Ecocamp tenía un guitarrista en el salón comunal. Vino, música, y la chimenea. La manera perfecta y el día perfecto para practicar los rituales de amor propio! A la mañana siguiente desayunamos temprano y nos encontramos camino a Punta Arenas para tomar nuestro vuelo de regreso a Santiago. -Ecocamp utiliza energía solar (40%). -Tienen sistemas de reutilización de agua. -Todos los baños son compostables. -Su menú ofrece opciones veganas y vegetarianas (pregunten de antemano). -Las frutas y verduras son locales y frescas. -Utilizaron materiales de construcción sostenibles y recuperados. -Las cúpulas/domos estándar no tienen calefacción ni chimeneas, pero igual son lo suficientemente calientes gracias a la insulación. -Los domos estándar comparten un baño con todos los demás huéspedes. -Los domos de las suites cuentan con baño propio y chimenea. -El hotel ofrece diferentes actividades según la duración de la estadía (hiking, safaris, glaciares, etc). - Ofrecen yoga en las mañanas y tardes. -Tienen una estación de agua y café. -Recibirán una botella de agua reutilizable como regalo y un cuaderno con información sobre el hotel con un mapa de Torres del Paine, a su llegada. -Los paquetes de Ecocamp dependen de la temporada, la duración (desde 3 noches hasta 6 noches) y el tipo de domo (estándar o suite). Incluyen comidas, meriendas, estadía, transporte en coche y actividades. -No hay WI-FI en Ecocamp. Es para desconectar y volver a conectar con la naturaleza! Ellos ofrecen una computadora portátil para uso de emergencia y correos electrónicos.